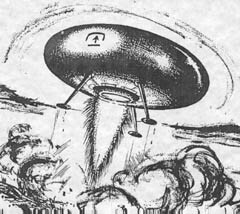 Following the UFO wave of 1957, a drought of sightings ran from 1958 to about 1964. Larry Hatch catalogued about 100 events per year in that period with his "U" Database, the lowest count being 1963 with only 61 sightings. The 1954 European wave included some physical trace cases, and there was a scattering of reports after that. However, cases of this type increased markedly after 1963. 1964 was the year the landing reports became more prominent, beginning with the blockbuster event on April 24 at Socorro, New Mexico. (Note: Brad Sparks: My impression is that 1958-63 were not a "drought" at all, that it is only the civilian outsider's viewpoint not knowing what the AF was collecting. The BB files indicate a continuing stream of high quality UFO cases some of astounding merit). As far as 1964 was concerned, we all note a surprising lack of sightings reported in the first three months..
Our thanks for these chronologies must go to our documentation team: Rebecca Wise (Project Blue Book Archive), Dan Wilson (archive researcher), Jean Waskiewicz (UFO dBase), and Brad Sparks (Comprehensive Catalog of Project Blue Book). Unknowns). At 11:40 a.m. PST, NORAD advised that there were 6 to 12 unidentified flying objects at 30 miles east of Merced, California. Radar picked up 12 objects at altitudes 60,000 feet, 90,000 feet and higher elevations. A message sent to Air Staff said objects were following a 60 mile race-track pattern. F-106's were scrambled at Castle AFB. Pilots locked on to some of the objects but could not keep the lock. NORAD said they were sending two more aircraft with pilots in pressure suits. April 24, 1964; Newark Valley, NY. Farmer found shiny elliptical object in field, confronted by two small humanoids who spoke with him (UFOE Section XII). 8:50 p.m. One object observed visually by a civilian pilot about 50 miles south of Minot AFB. Ground radar picked up the object. The object appeared as a light 3000 feet below the aircraft flying at 7000 feet and seemed to be following the aircraft. Minot AFB GCA reported a scope indication of an object at 160 degrees bearing 15 miles moving outbound at approx. 25 miles from the station, orbiting in a five mile circle.The object then proceeded inbound to the station to approx 15 miles and disappearing from the scope. (Dan Wilson, Brad Sparks, McDonald list). B-57, white object landed, photo recon. May 5, 1964; Comstock, MN. Object landed in field, physical traces (UFOE Section VII). Domed disc rose from woods, electromagnetic (E-M) effects on van, 10-meter (30-foot) burnt circle found next day (UFOE Section XII). 11:30 p.m. local. Two scrambles, radar/visual, UFOs sent proper IFF signals. May 19, 1964; Hubbard, OR. Animal reaction case. Rectangular object with legs left flattened wheat and three indentations on the edge of a circle (UFOE Section VII). Operations and Training updated from previous edition. 7:43 p.m. EDST. Paul Wankowicz, RAF pilot and ex-Smithsonian satellite tracker, saw a thin, white ellipsoid (3.5x length/width ratio), estimated 15-20 ft in length if at 1,000 ft, fly straight and level, travel from nearly overhead at 80° elevation in the NE to about 20-30° elevation in the ENE, where it disappeared behind the roof of the Sears Roebuck store as viewed from his car in the parking lot to the S, looking out the window. Estimated angular speed equivalent of 200 mph at 1,000 ft (17°/sec) or 1,000 to 3,000 arcmins/sec (17°-50°/sec) in agreement. Briefly lost sight of UFO as it passed behind 40% cumulus cloud cover. No noise or trail. Estimated tops of cumulus clouds at least 3,500 ft, thus speed at least 700 mph and length 50-70 ft. (McDonald, Sparks; Basterfield; BB files; NICAP website; Berliner) 3-4 secs, 1 witn, 1/3rd to 1/2 moon. 9:00 p.m. Charles Englebrecht (18) reported that a small basketball-sized object had landed in his back yard with E-M effects. Possible UFO "probe" or "ball lightning". (Investigated by William Powers and Fran Ridge of Indiana Unit No. 1 team, NICAP; Fold 3). Indianapolis Star, June 28 - "Mysterious Markings in Field Baffle Perry County Farm Family". A five foot circular burned circle, with three intensely burned circles arranged in a triangular shape as though made by table legs were discovered in the alfalfa field. June 29, 1964; Lavonia, GA.
Brilliantly lit top-shaped object made head-on passes at car, paced ahead of it, hovering and darting motions (UFOE Section XII). NICAP report, The UFO Evidence, released to Congress and news media. July 16, 1964; Conklin, NY. Humanoid with dark suit and helmet, climbed on top of craft. Physical traces found at site (UFOE Section XII). Sept. 15, 1964; Big Sur, Cal. UFO reportedly filmed disabling Atlas warhead. October 11, 1964; Brockton, MA. Engineer, others, observed dome-shaped object following jet fighters. UFO shot straight up and out of sight (UFOE Section IV). Midnight +. Four businessmen on a night fishing trip reported an object described as a brilliant red light that lit the fields and the banks of a stream. A herd of about 50 cows made noise and ran when the object approached slowly at low altitude and hovered overhead. The men hid behind a car to keep from being trampled or swept into the river. After a few minutes, the object accelerated and disappeared, and the cows quieted down. The presence or absence of sound from the object is not addressed. No EM effects or physiological effects were reported. Fifty cows reacted to low object. November 25, 1964; New Berlin, NY. Two objects landed on hilltop, large group of humanoid beings engaged in apparent repair operation for four hours (UFOE Section XII).